I haven't been sewing as much lately, first of all because I am pregnant (#3) and just barely starting to feel like myself again, second of all the weather has turned beautiful and we've been out a lot. It's been a nice break. I feel like my quilting comes in waves...we'll see if I have the energy to get going again. I have about 6 baby quilts that need to be made for friends and family. I love making baby quilts, so fast and quick. I used some of my smaller scraps for the back along with the pink happy campers. I was going to quilt in circles, but chickened out and just did a regular stipple. I still like it alot. several of you asked about the difficulty of the circles. I would say this quilt is intermediate, not hard, but not for the beginner. I have always been afraid to try curves, but I found this to be fun (especially since there are no corners to match up). I purchased the pattern here. 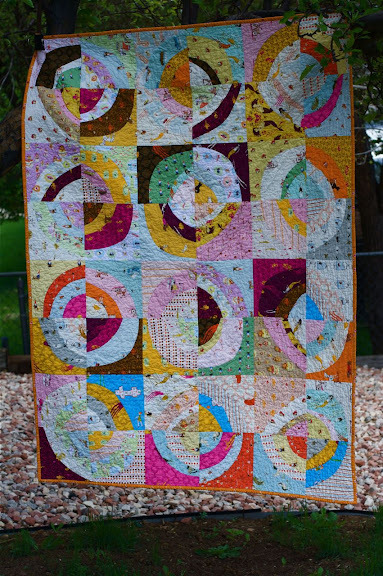 Your circles quilt is gorgeous! and Congrats on your pregnancy! Hope all goes well for you and your family! OMG, this would be my favorite quilt. I love all Heather Ross fabric. and this quilt is adorable. Ohhhh, I LOVE this pattern! So cute!!! This is a winner! Love it! This quilt rocks! I am so scared of curves. But you make me want to try. Is this from a pattern? If so, where can I find it? This turned out absolutely beautiful Nettie! And congratulations! Thanks for linking to my etsy shop! I really like this quilt too! Perfect fabric choices with the unusual pattern. First: congratulations on baby number 3. I hope the rest of your pregnancy is easy. Second: the quilt is awesome. I love it. 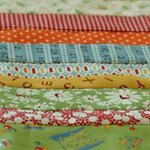 And third: quilting will always be around - nice weather comes and goes - grab it while you can and don't feel bad about it! Congrats on baby #3. I too love this quilt. The colors and the circles are so cute! I think you should keep this one! Your little one would get lots of good out of it and treasure it always! What a blessing to be a friend that gives quilts. I have just started doing the same...I too, love the baby size and colors when I quilt...and I just get a big kick out of their reactions! I think it might be more of a blessing for me to give them, then for them to get one. Your circles quilt is so colorful and wonderful! All of your work is great! Congrats on the pregnancy! Congratulations on your baby news! I'm glad to hear you're going to keep this quilt - it's fabulous. I really love the scrappy circles. Makes me feel like even I could try this. Congratulations on the third pending arrival! Love this quilt, so pretty! Sounds like you need to get some serious sewing time in before your life is, once again, taken up with 3-hourly feeding, nappy changes and lots and lots of cuddling. (Not to mention the other 2 children who will also be needing your time and attention). The circle quilt is absolutely stunning. Great work! That is funny...when I had my second I had no inclination to sew! I am hoping that won't happen again when #3 rolls around. I love this quilt it is great and I love the circle ~ a perfect summer quilt. i have never seen anything like this; it is perfect, that heather ross fabric really compliments the pattern! well done and congrats! yay! number three! that is so great. i bet you will start feeling like yourself again soon. I love the circle quilt. beautiful work. 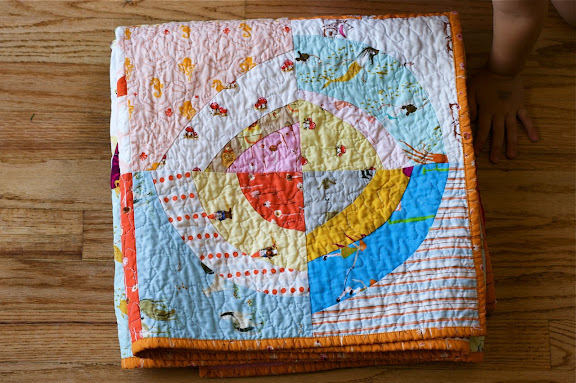 This circle quilt is wonderful! I may have to try a circle quilt with your comment about not matching corners!! Love it! Gorgeous! And Congratulations to you! This quilt is wonderful! Congratulations for your pregnancy. Great quilt! Congrats on #3. I love this! I wouldn't have thought to put all the different Heather Ross' together but they look great. That is so beautiful. The pattern really shows off the fabric nicely. 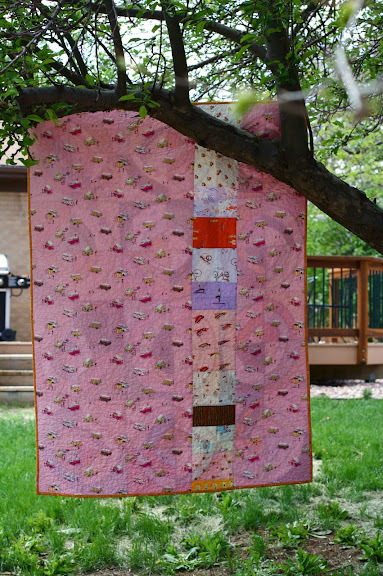 Gorgeous quilt and the fabrics are adorable! Many congratulations to you! The quilt is just adorable - I agree you shoulsd keep it ready for the arrival of bump! so cute, nettie. sure wish i had a heather ross stash like that one! hope you are feeling well! give the future little one a pat for me. the quilt is wonderful! i think quilting in circles would be very very hard. i've had the thought of trying them before, too, but i always chicken out. congrats again on the new little one. Nettie - tell me were the circles hard to sew? and do you need to clip the seams so they lay flat? The quilt looks great - better than the one on the pattern, IMHO. This quilt looks amazing! I love the design and fabric choices! wow, fabulous! I love the way you have done this! Love your quilt!! I understand the quilting in waves . . . it happens this time of year for most i think! Congratulations on your new addition! What a shocker to see you pointing out my stash, lol. You inspired me to sew something yesterday. Sometimes I forget the sheer joy I feel from sewing. Your quilts are always absolutely wonderful, just as much as you are sweet. Great quilt !! Congratulations for this pregnancy !! Very happy to see you back. Congratulations! I just found you awhile back and kept checking and wondered where you were. I am glad you had a good excuse. I have the same circle quilt started but I have a problem with the circles not matching. Silly I know maybe I'll get back to it. You inspire. Take care and happy quilting. Congrats on #3! I'm currently pregnant with our #3 too! Due in October/November. You did a great job on this quilt- I love it. I just discovered you!! Oh your work is making me drool (I know..eww!) I'll be back!! Wow, you use such happy colors! Such a beautiful quilt. Looks like a lot of work went into this. I've done this pattern. I like your scrappy color choices. I feel I little out of place with all your "young" followers but I'll join because I like your style. Please come visit me even though I'm part of the older generation. I really like this quilt. Looks really sharp. good job and congrat's on the new addition. I love this quilt! Love Heather Ross. I'm featuring her today on my blog. Oh, I love this quilt! I think I may have to buy the pattern too. Congratulations on your pregnancy! I can see why you were not up to sewing, but believe me, it will get better again! Love your circles quilt. Oh my goodness!!! I LOVE THIS QUILT! Another on the big long list!! !